At no time during the Great Depression was the contradiction between agriculture surplus and widespread hunger more wrenchingly graphic than in the government's attempt to raise pork prices through the mass slaughter of miliions of "unripe" little pigs. This contradiction was widely perceived as a "paradox." In fact, as Janet Poppendieck makes clear in this newly expanded and updated volume, it was a normal, predictable working of an economic system rendered extreme by the Depression. The notion of paradox, however, captured the imagination of the public and policy makers, and it was to this definition of the problem that surplus commodities distribution programs in the Hoover and Roosevelt administrations were addressed. 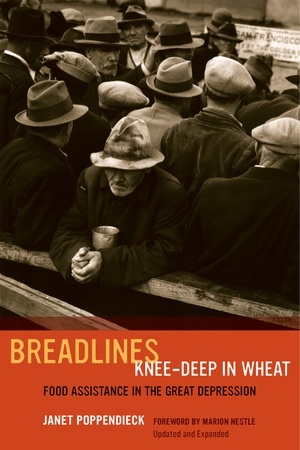 This book explains in readable narrative how the New Deal food assistance effort, originally conceived as a relief measure for poor people, became a program designed to raise the incomes of commercial farmers. In a broader sense, the book explains how the New Deal years were formative for food assistance in subsequent administrations; it also examines the performance--or lack of performance--of subsequent in-kind relief programs. Beginning with a brief survey of the history of the American farmer before the depression and the impact of the Depression on farmers, the author describes the development of Hoover assistance programs and the events at the end of that administration that shaped the "historical moment" seized by the early New Deal. Poppendieck goes on to analyze the food assistance policies and programs of the Roosevelt years, the particular series of events that culminated in the decision to purchase surplus agriculture products and distribute them to the poor, the institutionalization of this approach, the resutls achieved, and the interest groups formed. The book also looks at the takeover of food assistance by the U.S. Department of Agriculture and its gradual adaptation for use as a tool in the maintenance of farm income. Utliizing a wide variety of official and unofficial sources, the author reveals with unusual clarity the evolution from a policy directly responsive to the poor to a policy serving mainly democratic needs. Janet Poppendieck is Professor Emerita of Sociology and Policy Director of the New York City Food Policy Center at Hunter College, City University of New York. She is the author of Free for All: Fixing School Food in America (UC Press) and Sweet Charity? Emergency Food and the End of Entitlement.